“The Lord God had not caused it to rain upon the earth, and there was not a man to till the ground. But there went up a mist from the earth, and watered the whole face of the ground” (Gen 2: 5,6). God was pleased to water the face of the ground with a mist that went up from the earth. The mist that went up from the earth can be compared to saints who live a lofty life and keep themselves above all earthly attachments. God is pleased to use such saints to remove the dry experiences in others, and be a source of blessing to them. Tilling the ground was not necessary till the day man committed sin. 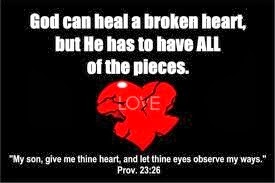 In other words, since the heart of man was soft, perfect and sinless there was no need for it to be broken. But when man committed sin, God cursed the ground and it brought forth thorns and thistles. Man now has to suffer and till the ground. Thorn and thistles can be compared to the evil nature which grew in man after his fall. We have to labour for a broken heart to remove these evil natures. Tilling the ground was necessary, to grow fruits and flowers and other useful trees. So also, breaking our hardened heart is essential if we are to get a sweet-smelling life (flowers) and divine characters (fruits). Let us labour for a broken heart and take out all the evil natures in us and develop a fragrant and divine character, so that we may become a source of blessing to everyone.